and we'll order it from our supplier immediately. 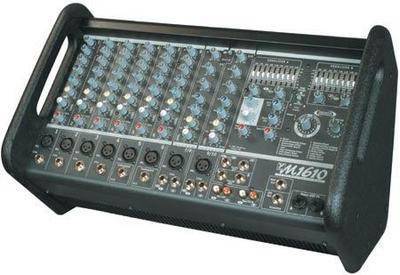 The M1610 is the most versatile compact powered mixer on the market. The convenient, lightweight and compact box mixer with the tilt-back visibility and channel control access of a desk mixer makes it an ideal high power, high quality solution. High-powered, high-efficiency class-H power amplifiers, advanced input strips, on-board DSP, effective master EQ section and ten very useful and usable input channels complete the wedge mixer package.The 1600-watt M1610 has two integrated 800-watt power amplifiers that can be assigned as stereo mains, or mono main and mono monitor. Each amplifier is attached to an innovative master EQ section designed specifically for these new mixers. The master EQ has a 9-band graphic EQ with additional high and low shelving EQ`s at either end of the frequency band. The nine graphic sliders are essentially all of the middle bands of a 15-band graphic EQ with the low and high frequency bands covered by separate shelving controls. This gives the user more control over the feedback-prone mid frequency bands with high and low tone-shaping frequencies controlled by additional simple +/- 15 dB trim controls.The M1610 has 10 input channels. The first six channels have balanced XLR microphone and TRS balanced inputs, input trim control, three-band EQ, master volume and trim set light. The mono line inputs on channels 5 and 6 are pre-EQ`d for Hi-Z instrument level input, making them an ideal place to start when looking for that perfect live acoustic guitar or direct bass sound. When the input trim level is properly set, users will have ample overall gain while taking full advantage of the new clip elimination circuit which makes it virtually impossible to distort the input of the microphone and instrument channels.Yorkville Box Mixers feature 15mm plywood and heavy-gauge metal construction to withstand all the rocking and rolling associated with life on the road. Inside we use high quality epoxy circuit boards coated with thick copper laminate and precision, low noise components. A large heatsink and a variable speed fan ensure that the mixers keep their cool. Of course MicroMIX mixers also come with Yorkville`s standard two year (even if you break it!) transferable warranty in the USA and Canada. These are just a few of the characteristics which make MicroMIX mixers the Best Bang for the Box . Features:- 10 Channels - 800 watts per channel @ 4 ohm (Assignable Left/Right or Main/Monitor) - Gold plated dual contact XLR connectors (all channels) - TRS balanced inputs (dual inputs for stereo channels 7/8 and 9/10) - Set LED`s for easy and proper adjustment of Trim control - 3 bands of EQ on channel strips - 9 band graphic EQ for each output with shelving EQ for precise control - Built in Digital Effects - Footswitch jack for bypassing effects - Mute switch (channels 1-8) for quick change-over between band and DJ - Dual RCA Tape/CD In and Rec Out jacks.